Preheat a char-grill pan or barbecue to high heat. To make the harissa and tomato butter, place the butter, harissa, tomato paste, lemon, salt and pepper in a small food processor and process until smooth and combined. Set aside. To make the pesto butter, place the butter and pesto in a small bowl and mix to combine. Set aside. To make the nori and Japanese mayonnaise butter, place the butter and nori in a small food processor and process until the nori is finely chopped. Add the mayonnaise and pulse to combine. Cook the corn for 15–18 minutes, turning, or until charred. 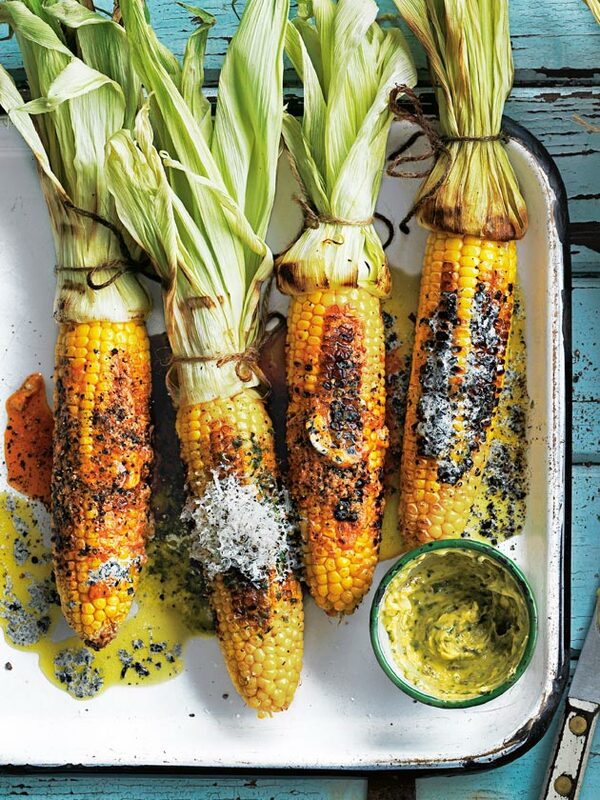 Spread 2 corncobs with the harissa and tomato butter, 2 corncobs with the pesto butter and 2 corncobs with the nori and Japanese mayonnaise butter. Top the pesto butter corncobs with parmesan. Sprinkle with pepper and serve the corncobs with the remaining butters. Makes 6.